Project obstacles and solutions: Penguin Random House announced plans to expand their Crawfordsville warehouse and distribution center to include an additional 350,000 square feet added to the current facility. Duke Construction was the general contractor and Lithko Construction handled the concrete work on the project. In total, IMI supplied 7,000 yards of concrete for the Random House expansion. The floor of the facility was poured in sections, 850 yards of concrete continuously for 7-8 hours per section. Pours were done at night. It was important that there be a constant stream of concrete to the site so that there were not starts and stops with the crews from Lithko. 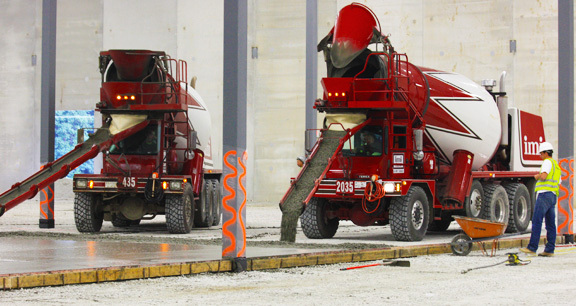 IMI spaced trucks so that there were no breaks in the flow of concrete during the entire pour. The challenge in pouring this large of a slab is keeping it flat. Curling can occur in an interior slab when there is a difference in the moisture content or temperature from the top of the slab to the bottom. For a job of this size, the supply of quality raw materials is crucial. In particular, the size and type of coarse aggregates can aid in even curing. IMI designed and tested a mix that was specific to the pouring of large interior floors. It kept plastic shrinkage to a minimum and helped Lithko meet their flatness specification on the job.